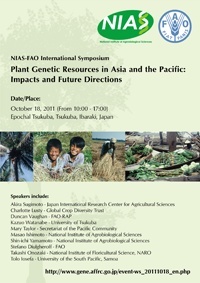 The objectives of the NIAS-FAO international symposium are to discuss, with reference to Asia and the Pacific, the impacts plant genetic resources have had on improving crop productivity and the future directions related to conservation and sustainable use of plant genetic resources. In addition the symposium will have leaders of plant genetic resources programs from 15 Asian and 1 Pacific countries who will share their perspectives and information related to plant genetic resources. This symposium provides an opportunity to deepen cooperation, collaboration and exchange between participants. Registration fee is FREE. Please enter the form below and click “Submit”. The deadline is October 13. Same day applications are available. Please send us E-mail using contact form.